This is yet another wonderful recipe from the cookbook Arabesque by Claudia Roden. This cookbook covers cuisine from Morocco, Turkey and Lebanon. This particular recipe is Moroccan. It calls for the use of Argan oil, which is called the "liquid gold" of Morocco. (In this recipe you can substitute extra virgin olive oil). Argan oil has a wonderful nutty flavor, and is a "finishing oil". It is quite pricey, but the unique flavor makes all the difference in recipes. 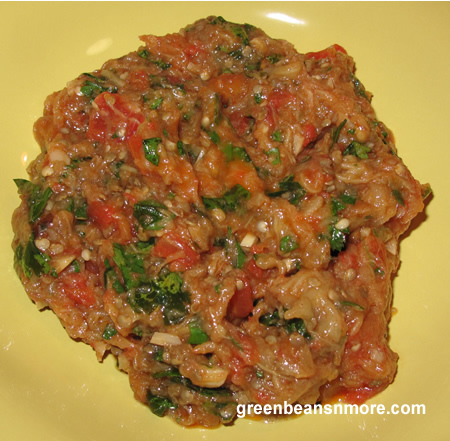 We found this Mashed Eggplant and Tomato Salad to have wonderful refreshing flavor. Chef Roden suggests that you make it several hours in advance. We refrigerated it overnight to let the flavor develop. We let it come to room temperature and served it with an Afghan bread. Prick the eggplants with a pointed knife to prevent them from bursting in the oven. Place them on a large piece of foil on a baking sheet and roast them in a hot oven pre-heated to 425 degrees F for about 45 to 55 minutes, or until they feel very soft when you press them and the skins are wrinkled. When cool enough to handle, peel and drop them in a bowl of water with a little lemon juice to keep their flesh pale. Drain the eggplants in a strainer or colander with small holes and press out as much of the water and juice as possible. Still in the colander, chop the flesh with a pointed knife, then mash it with a fork or wooden spoon, letting the juices escape through the holes. Cook the tomatoes with the garlic and a little salt over a low heat for about 20 minutes, or until reduced to a thick sauce, stirring occasionally. Mix with the mashed eggplants and the rest of the ingredients, and add salt to taste. To serve, spread flat on a plate and garnish with olives.